Darren Turner made his long-awaited debut at the Liqui-Moly Bathurst 12 Hour race this weekend and in the process ticked the legendary Mount Panorama circuit off his racing bucket list. 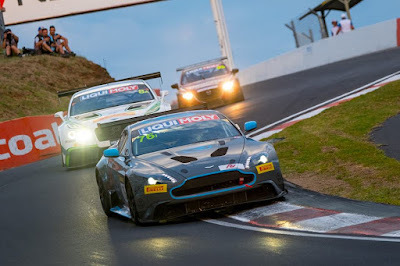 Driving the #76 R-Motorsport Aston Martin Vantage GT8, alongside Florian Kamelger and Markus Lungstrass, Turner finished the race in fifth place in the invitational class for production cars. It was Turner who took the start of the 12-hour race and he soon moved from eighth in class up to sixth place. All three R-Motorsport drivers had clean runs, quickly getting into the groove of the circuit and avoiding any unnecessary trouble. The Vantage GT8 ran in the invitational class, which featured a wide range of cars so the fifth place finish was a great result for the team. “Considering that the GT8 is a production car it was an impressive run,” said Turner. “This circuit is brutal on cars but the GT8 ran like clockwork. I’d like to say ‘get well soon’ to a rather battered and bruised Jan Struve who had an accident in the sister GT4 R-Motorsport car.